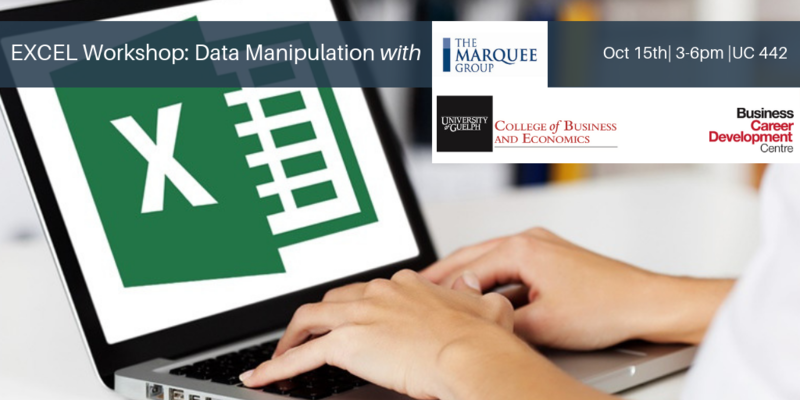 The Marquee Group, Canada's leading provider of financial modeling training programs, in conjunction with the Business Career Development Centre, is pleased to offer its Excel seminar to University of Guelph students. This is a three hour seminar that combines interactive discussions with hands-on Excel computer work. Please note: Bring your laptop! Transforms participants into Excel "Power Users"
Established in 2002, The Marquee Group specializes in providing current and aspiring financial professionals the tools they need to master the most important areas of financial modeling and analysis. Marquee has provided instructor-led training seminars to thousands of professionals and students in Canada, the United States, the United Kingdom, Mexico, Australia and China. For several years, The Marquee Group has conducted the annual training programs at numerous banks, pension funds and business schools. Register today via ExperienceGuelph  to save your spot for the event. Space is limited. Fee is $25.00 to be collected upon reminders.